[S1718] Emails between Dr David Greathead and Jan Cooper 2 October 1997 together with much information from David's wonderful book "A Passage to the Cape of Good Hope" David has since very sadly died. [S4500] Emails between Tony Goggins and Jan Cooper from 11 March 2003. [S3] GRO Indexes - 1891/Q4 Birkenhead Volume 8a Page 560a. [S275] E-mails between Shirley Sanderson and Jan Cooper from 28 September 2009. [S3] GRO Indexes - 1919/Q3 Birkenhead Volume 8a Page 1443. [S41939] National Register 1939 - Find my pastRG101/1825B/012. [S3] GRO Indexes - 1960/Q1 Maidstone Volume 5b Page 675 age 82. [S3] GRO Indexes - 1874/Q1 Maidstone Volume 5f Page 1587. [S3] GRO Indexes - 1920/Q2 Paddington Volume 1a Page 57a. [S3] GRO Indexes - 1951/Q3 Maidstone Volume 5b Page 1681. [S3] GRO Indexes - September 2003 Great Yarmouth District 6361A Reg A76B Ent No 153 DOR 0903. [S3] GRO Indexes - 1923/Q2 Paddington Volume 1a Page 906. [S25399] Emails between Dennis Frere-Smith and Jan Cooper from 9 August 2010. [S3] GRO Indexes - 1950/Q3 Surrey N E Volume 5g Page 1412. [S3] GRO Indexes - May 1984 Norwich Outer Volume 10 Page 2173. [S3] GRO Indexes - December 1999 North Walsham District 6381 Reg ER49A Ent No 019 DOR 1299. [S3] GRO Indexes - 1929/Q1 Croydon Volume 2a Page 680. CHRISTOPHER FRERE-SMITH, who has died aged 72, founded the Keep Britain Out (of the Common Market) campaign and then, following Britain's accession, the Get Britain Out campaign. Over the next 12 years he waged a principled, single-minded but often lonely war against Britain's entry, arguing that the underlying purposes of the EEC were political not economic, as the British people were being led to believe. He stood twice for Parliament. In 1966, at the St Marylebone seat of Quintin Hogg (now Lord Hailsham), he polled 445 votes as an anti-EEC candidate. In 1972, he got 1,332 votes at a by-election in Sutton and Cheam. Frere-Smith combined uncompromising views with a flair for publicity. In 1967 he led a delegation to the Elysee Palace to present a letter to President de Gaulle assuring him that the majority of the British people were opposed to membership. The same year, after the Labour government decided to apply to join, he appeared on the steps of 10 Downing Street at the head of a procession of "mourners" behind a coffin purporting to contain the mortal remains of British democracy. In 1970, he warned bemused officials at the European Commission in Brussels that there would be so much "trouble" in the Community if Britain joined that a future parliament would be compelled to take the country out again. "We like you," he told a sceptical press in Brussels. "We enjoy coming here for holidays. But we are a maritime nation, depending for its livelihood on trading with the world, with connections throughout the world and in the Commonwealth developed over centuries." Frere-Smith was one of the first to recognise the value of conducting mini-referendums in individual constituencies as a way of drawing attention to public feeling on particular issues. In 1971 he paid for three such polls, all of which resulted in a majority against Britain's entry. In January 1972, he was arrested by Brussels police outside the Palais d'Egmont after refusing to end his protest against Britain's accession to the Common Market, which was to due to be finalised by treaty that day. Later that year, Frere-Smith and 250 other demonstrators were involved in a brawl with French police aboard a cross-channel ferry after they had been refused permission to disembark at Calais to attend a meeting. "Only last week the French prime minister said the new Europe would be an oasis of public and private liberty," Frere-Smith declared to the rousing strains of Rule Britannia! "But look at it. This afternoon we have had a taste of what French democracy is all about." As chairman of Get Britain Out, Frere-Smith was prominent during the referendum in 1975 on whether to stay in the Common Market. He compared those who supported Britain's continued membership to those who had advocated appeasement of Germany during the 1930s. After the referendum confirmed Britain's membership, the Get Britain Out campaign disbanded and Frere-Smith faded from the political scene. But he warned: "It is our belief, now that the campaign is over, that our partners will proceed full steam ahead towards political union." He added that he believed that the British people had not voted for economic and monetary union, for integration in a federal state or for the transfer of more powers from Parliament to Brussels. 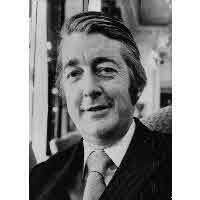 Christopher Newman Frere-Smith was born on March 28 1928 and educated at Sutton Downs School, Kent. He did National Service in the Rifle Brigade and then read Law at Gonville and Caius College, Cambridge, where he was secretary of the University Liberal Club. He remained an active Liberal until the late 1950s, when he left the party after deciding that it no longer had a coherent set of policies. From 1955 he worked as a solicitor in sole practice in Upper Berkeley Street, Mayfair. In 1973 he became the first solicitor to appear and speak on behalf of a client at the Old Bailey (until 1972 solicitors had only been allowed to argue cases in the lower courts). During the 1970s he served as a deputy Crown Court judge. From the late 1950s until his death, he chaired the management committee of Caius House, Battersea, a charitable foundation working with young people. [S3] GRO Indexes - 1928/Q2 Kingston Volume 2a Page 861. [S3] GRO Indexes - 1956/Q1 London City Volume 5d Page 327. [S3] GRO Indexes - 1959/Q3 Chelsea Volume 5c Page 642. [S3] GRO Indexes - 1968/Q3 St Marylebone Volume 5d Page 2497. [S3] GRO Indexes - October 2000 Westminster District 2581D Reg D46C Ent 015 DOR 1000. [S3] GRO Indexes - 1963/Q2 Kensington Volume 5c Page 1963. [S2867] Emails between Richard Greathead and Jan Cooper from 9 June 2003. [S3] GRO Indexes - 1883/Q2 Fulham Volume 1a Page 190. [S4561] Emails between Hilary Patricia Ferrey - Groves and Jan Cooper from 20 September 2001. Peter Irvine Pare was born on 11 January 1916 in Seychelles.1,2 He was the son of Maurice Pare and Agnes Ninita Smith. He was a Travel Agent. He married Stella Brooke-Smith. [S4500] Emails between Tony Goggins and Jan Cooper from 11 March 2003 1919.